"Blue-green"? Too dull. Dave Thomas came up with "viridian joule" and won a plaque, a trip to the L.A. auto show and 15 minutes of fame. Dave Thomas, a Florida man who works at a trophy store in Orlando, Fla., won Chevrolet's nationwide contest to name the lead color for the Volt plug-in hybrid, which Chevy will launch a year from now. The winning entry: "viridian joule." That's the silvery blue and green color that Chevrolet has used to show pre-production versions of the Volt and will be the dominant launch color. Viridian is a color of green, with a tint of blue; joule is measurement of energy. Thomas' winning entry narrowly beat EnvironMINT and EV-ergreen. 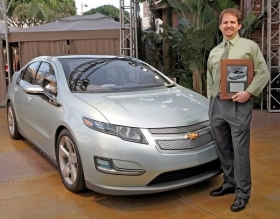 GM flew Thomas to Los Angeles this month to let him drive the Volt that was on display there at the auto show. His impressions: "It's quiet, like sitting in a parked car. When the gasoline engine kicks in, you hear a little whir, and that's it. The car is fast. It has a lot of get-up-and-go. "The only thing I don't like about it is that it is not in my driveway."